In the complex, multifaceted fate of Vrubel, there was no serene prosperity since the year of birth: he lost his mother early, wandered a lot, moving with his family from one city to another. Then the hard time of the doctrine, painted with adversity, deprivation, then long, long years of non-recognition, a serious illness, and finally, after the threshold of the fifth decade, there is a turning point. Finally, in 1896, an eternal wanderer, an unsettled and homeless painter finds his pier. His dream came true. He fell in love. Nadezhda Ivanovna Zabela – a well-known singer brought to the inner world of Vrubel the charm of feminine charm and peace of mind. Vrubel was happy in marriage, his wife with great success performed on the stage of the Mamontov Private Opera, and his own reputation – at least in the artistic circles – was steadily growing. In 1901, Vrubel had a boy named Savva. For five years, before the disaster erupted, both were happy, and for both these five years were the time of the highest creative upsurge. Out of all connection with the circumstances of his personal life, apparently favorable, Vrubel began to take over the gloomy feverish excitement, the first symptoms of impending mental illness appeared. In 1902, the artist presented to the public a picture of a demon defeated, above her Vrubel worked tensely and painfully. This picture was a mournful milestone in the biography of Vrubel. She was still hanging at the exhibition, when her author had to be placed in one of the Moscow psychiatric hospitals. In February 1903 Vrubel left the hospital, but not for long. The constant depression and sudden death of his son – and Vrubel again forced to go to the hospital. With small interruptions the illness lasted until the end of the artist’s life. Then in one or another clinic – he spent the last years of his life, slowly fading. Zabela was always there. She visited Vrubel in the hospital, often he sang. In the last years of his life Vrubel creates the last image of his muse – the picture After the concert. Here it is depicted resting on a couch near a burning fireplace. She is wearing one of those extraordinary concert dresses that Vrubel invented for her – a dress made of several transparent cases of various colors, similar to an exotic flower. Often the dresses were uncomfortable, but Zabela worn them without resentment, she fully trusted the artistic instinct of her husband. The love of Nadezhda Ivanovna helped Mikhail Vrubel. It was, in fact, a harmonious marriage. Painting After the concert was not finished – the artist had already seen almost nothing, confused colors, took the wrong brushes and, finally, had to stop work on this work. Having lost sight and desire to live, Michael Vrubel died in 1910 from pneumonia, just a few minutes before the arrival of his lover. And three years later Nadezhda Ivanovna, having returned from the concert, suddenly died after a short attack. Description and meaning of the painting After the concert. 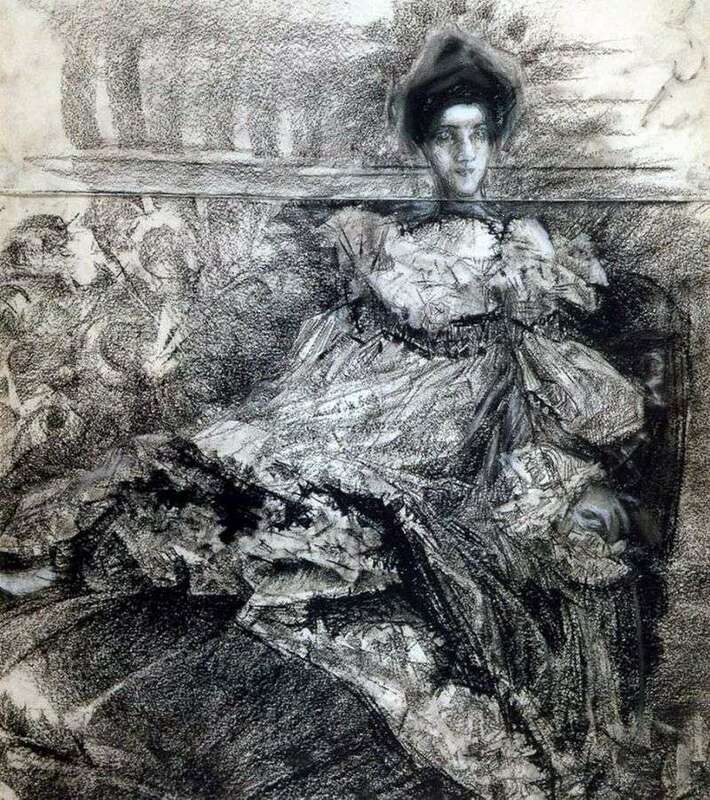 Portrait of NI Zabela by Mikhail Vrubel.